Check-in is at 3:00 pm. Should you arrive early, we will happily park your car and store your luggage. When your room is ready, we will give you a call. Complimentary breakfast is served daily from 7:00am – 10:00am in our newly renovated rooftop solarium. Enjoy our wide selection of delicious pastries, gourmet breakfast sandwiches, quiches, fresh fruits, juices, coffee, tea, and more while taking in the beautiful historic views of downtown Charleston. Do you serve lunch or dinner? We do not serve lunch or dinner, but there are dozens of incredible restaurants within walking distance of the Inn. We do not provide room service at the Inn. I understand you have an afternoon Wine + Cheese reception, can you tell me about that? We offer a lovely, complimentary Wine + Cheese reception daily from 4:00pm – 5:00pm in our newly renovated, rooftop solarium. 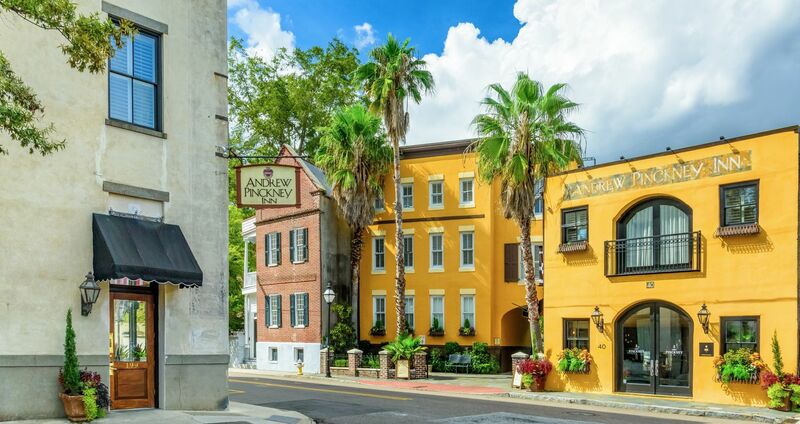 Come up and take in the beautiful historic Charleston views while you enjoy a selection of red and white wines, artisan cheeses and crackers, savory dips, fresh and dried fruits, and, of course, boiled peanuts. Do you have event or meeting space? We are able to accommodate intimate meetings of up to 10 people here at the Inn, but there are several options for larger meetings nearby. Please contact our Director of Sales, Jessica Bowman 843.724.4321 for assistance. We do not have a fitness center on-site, but we offer complimentary access to Pivotal Fitness, on Wentworth Street, just two blocks away. Passes are available at the Front Desk. Where do I park while staying at the Inn? We offer valet parking at a rate of $25.00/day. Unlimited in-and-out access is included in the daily rate. There is no free parking in the Downtown area. How far away is the City Market? The City Market is just one block from the Inn. How far away is the Charleston International Airport? The airport is approximately 12 miles from the Inn. During rush hour, it can take as much as 30 – 40 minutes to get to and from the airport, so please plan accordingly. We do not have an airport shuttle service. However, taxi service, rental cars, and Uber are readily available near baggage claim. If you need assistance arranging transportation back to the airport, please ask the front desk during your stay or at checkout. Folly Beach, Sullivan’s Island, and Isle of Palms are all approximately 10 – 12 miles from Downtown. What types of rooms to do have? We have several different room types, from cozy double bed rooms to spacious suites. Please visit our website for a full list of rooms and photos. What will the view from my room look like? Most rooms have street or garden views , since we are located in the heart of the City, but the views from our newly renovated rooftop Solarium provide an incredible view of historic Charleston. What if I need to check in late? Our Front Desk is staffed 24-hours a day. You may arrive at your leisure, but feel free call and let us know. Can I get a late checkout? Check-out is at 11:00am. Should you need a little extra time, please inquire at the front desk. You may leave your valet-parked vehicle and luggage with us until 4:00pm on day of check-out. We have a limited number of rollaway beds available. We highly recommend calling in advance to reserve one. We offer complimentary WiFi for all of our guests. A code will be provided to you at check-in. Do you permit smoking in any guest rooms? The Inn is entirely smoke-free. Fines will be imposed if evidence of smoking is found in your room. Our Front Desk team is happy to assist you with tour, attraction, and dining information. There is elevator access in the Main Inn building, but we do have a second building with rooms accessible only by stairs. Please let us know as soon as possible if you need elevator access. Do you have any handicapped accessible rooms? Yes, we have a limited number of handicapped accessible rooms. Please let us know as soon as possible if you need an accessible room. We do not have a bar on-site, but there are dozens of excellent bars and restaurants within walking distance of the Inn. We do offer a complimentary Wine + Cheese reception every afternoon from 4:00pm-5:00pm in our rooftop solarium. Is the Inn pet friendly? We are not a pet friendly Inn, but we can recommend several excellent kennels nearby for your furry family member. We do, of course, welcome ADA certified service animals at no charge. A fee may be imposed for damage to guest rooms by any pet or service animal. Is it cheaper to book a room on one of the discounted online travel sites? Contrary to popular belief, you will usually get the best rate at any hotel or inn by calling the property directly. We accept Visa, MasterCard, American Express, Discover, and cash. We have a small business center located in the main building with computer and printer access. We do not have a pool at the Inn. You may cancel your reservation up to 72-hours in advance of the arrival date. If you cancel within the 72-hour time frame, you will be charged for one night room and tax. Do you have hairdryers in your rooms? What toiletries do you provide? We provide shampoo, conditioner, bar soaps, body lotion, and shower gel in every guest room. Additional toiletries are available on request. Do you provide daily maid service? Daily maid service is provided. Do you have turndown service? We do not provide turndown service. Do you have vending machines and ice machines? Yes, we have soda machines and ice machines. There is a convenience store and a Five & Dime store within walking distance, should you need anything. I forgot some of my personal toiletries, what should I do? Do you have refrigerators in your guest rooms? Our rooms do not come equipped with mini-fridges, but one can be put in your room, on request. We have a limited number available, so please let us know as soon as possible if you will be needing one. Can I book your rooms for my entire wedding party? Group blocks are available. Please contact our Director of Sales, Jessica Bowman 843.724.4321 for more information.